Peppa Pig- My First Cinema Experience is coming to you at the Eden Cinemas from the 28th of March. 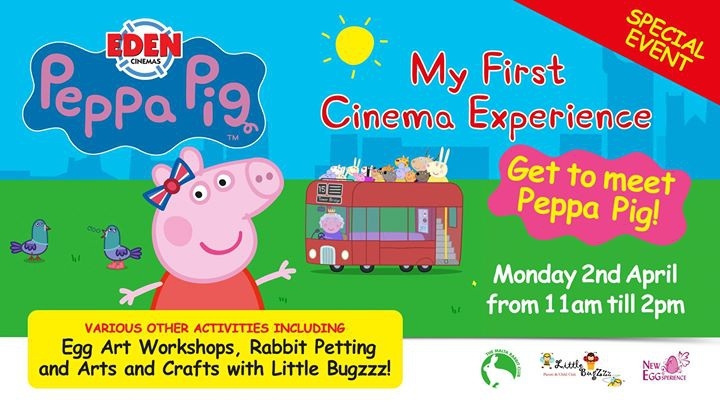 In spirit of this largely popular movie, Eden Cinemas has decided to go the extra mile and come up with a Peppa Pig event. This event will be taking place on the 2nd of April between 11am and 2pm in the Eden Cinemas Foyer. A number u surprises await all those who attend! Since this event happens to fall in the Easter holidays, we thought it would be a good idea to invite the The Malta Rabbit Club - Since 1963. Meet and Pet these lovely creatures and learn fun facts about them between 11.00 and 14.00! The New EGGsperience, Egg Art Gifts & Craft Supplies will be conducting egg art workshops for all those children with an eye for detail between 13:30 and 16.30! Little Bugzzz Parent and child club will also be joining us on the day setting up an arts and crafts section like no other between 11.00 and 14.30! And last but not least RC World Malta will also be giving out an amazing Peppa Pig gift to one lucky winner. So much in store for you at the Eden Cinemas!